Following the 2015 Paris climate agreement, the global politics of climate change depends more than ever on national climate policies and the actions of cities, businesses, and other non-state actors, as well as the transnational governance networks that link them. The Comparative Politics of Transnational Climate Governance sheds new light on these critical trends by exploring how domestic political, economic, and social forces systematically shape patterns of non-state actor participation in transnational climate initiatives. The book develops a common conceptual framework and uses a unique data set to explore the interplay between transnational and domestic politics and how these interactions shape the incentives and modalities of participation in transnational governance. The contributing chapters explore the role of cities, non-governmental organizations, companies, carbon markets, and regulations, as well as broader questions of effectiveness and global governance. 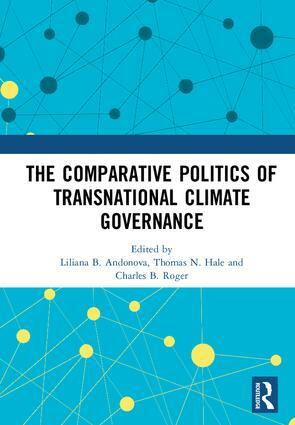 Bringing together some of the foremost experts in the field of global governance and environmental politics, this book significantly advances our understanding of transnational governance and provides new insights for policymakers seeking to address the problem of climate change. This book was originally published as a special issue of International Interactions. 6. Transnational Climate Governance Initiatives: Designed for Effective Climate Change Mitigation? Liliana B. Andonova is Professor of International Relations at the Graduate Institute of International and Development Studies, Geneva, Switzerland. Her research focuses on international institutions, transnational governance, public-private partnerships, European integration, and environmental cooperation. Andonova is the author of Governance Entrepreneurs: International Organizations and the Rise of Public-Private Partnerships, Transnational Politics of the Environment,and co-author of Transnational Climate Change Governance. Thomas N. Hale is Associate Professor at the Blavatnik School of Government at the University of Oxford, UK. His research seeks to explain how political institutions evolve—or not—to face the challenges of globalization. His books include Beyond Gridlock, Between Interests and Law: The Politics of Transnational Commercial Disputes and Transnational Climate Change Governance. Charles B. Roger is a SSHRC Postdoctoral Fellow in the Department of Political Science at the University of Toronto, Canada. His research focuses on processes of informal and transnational governance, and global environmental politics. He is a co-author of Transnational Climate Change Governance and co-editor of Global Governance at Risk.